In an effort to better our eating, I have been trying to implement a Meatless Monday in my home. This is not easy with a "Carnivore for Life" as a husband, but thankfully he is a pretty good sport about it. However, this past Monday he was not as willing to cut out the meat, so the challenge was to come up with a dish that I can add meat to, but would be equally as delicious without it. I had no idea what I was going to make until I went to the fridge and pantry, and there it was! The previous Friday I had purchased some beautiful kale from The Point Park Market Place in my area. Then, while looking in my pantry, I saw the Mushroom Fettuccine I had purchased from the Rossi Pasta stand at the market as well and all of the sudden the heavens opened, the angels began singing, and I KNEW what I was going to make! 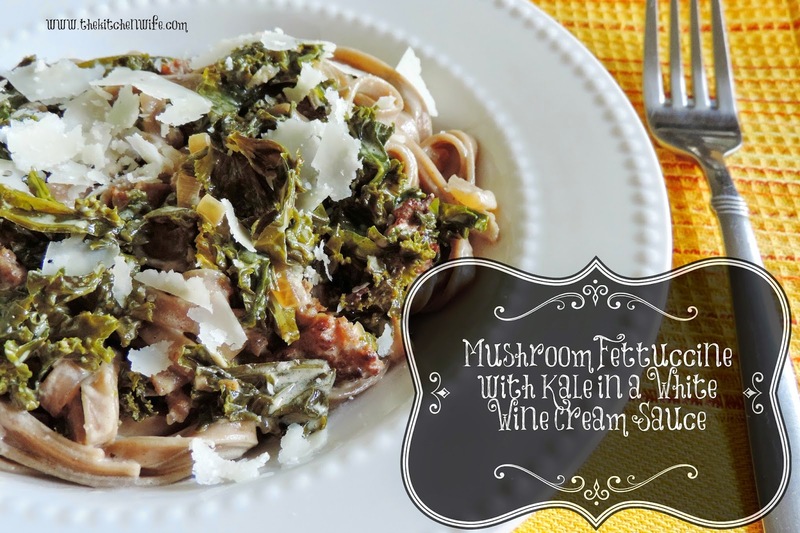 Mushroom Fettuccine with Kale in a White Wine Cream Sauce. As I said earlier, Studhubs was wanting some meat so I added a little Italian sausage, but trust me this dish would be amazing without it! I can't wait to show you how I did it! As with any pasta dish, you will want to put a pot of salted water on to boil. Then, add 2 tbsp. of olive oil to a deep skillet and place it over medium/high heat to get hot. While the skillet is getting hot, take the time to dice your onion, mince the garlic, and stem and chop the kale. Now it is time to brown the sausage. Once the sausage is fully cooked, add the onions and garlic. Cook until the onions are soft and translucent. Now you can add the wine to the pan. Take a moment and scrape up all of those yummy brown bits off the bottom of the pan. Once you have scraped those bits up, add the water. By now the pasta water is boiling and you can add the fettuccine. Cook accordning to the instructions on the package. Let the kale steam in the wine and water for 7 minutes. Once the kale is wilted and tender, move all the contents in the pan to the side. Stir it all together and let the sauce thicken. Taste for seasoning and add and salt and pepper you think it needs. And there you have it! A FABULOUS dish that is flavorful with or without the meat! Top with a little shaved Parmesan cheese maybe a few chili flakes for some spice. The is a wonderful summer time meal and a perfect example how a quick trip to your local farmer's market can not only save you money and support local farmers and business, but can inspire great meals as well! Add 2 tbsp. of olive oil to a deep skillet and place over medium/high heat to get hot. While the skillet is heating up, prep your vegetables. To the hot skillet, add the sausage and fully cook. Add the onions and garlic to the pan and cook until they are soft and translucent. Add the white wine to the pan and use a spatula to scrape up the brown bits from the bottom of the pan. Add the kale and cover. Let the kale steam or 7 minutes. Once the kale is steamed, move everything to the side of the pan and add the butter, cream, and cheese the the skillet. Stir everything together and let thicken. Add the pasta to the skillet and toss everything around until everything is coated.